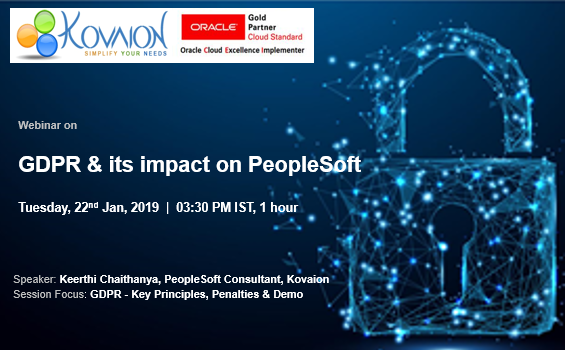 Kovaion presents an informative session on GDPR and its impact on PeopleSoft. The General Data Protection Regulation (GDPR) has come to force on May 2018 and is no longer optional. The GDPR affects all organizations, government agencies, and companies globally that offer goods and services in the European Union (EU) or collect/analyze data tied to EU constituents. GDPR ensures complete privacy of the individual’s data and personal information. No matter where an organization resides in the world, if EU citizens,they must ensure GDPR compliance. Organizations that neglect to agree to the solicitations will confront severe non-compliance penalties as well businesses that experience leaks and data breaches. Organizations have been quickly creating strategies and procedures to agree to GDPR. As per the International Association of Privacy Professionals (IAPP), one must be consistent to the direction before February 2019, as the first GDPR authorization activities are relied upon to initiate around then. 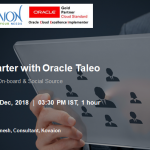 Kindly attend the Webinar on GDPR, Personally Identifiable Information (PII) , Peoplesoft updates and GDPR compliance and a a quick demo on GDPR Compliance using Acknowledgment Framework, Data Privacy Framework and Data Masking of PII Fields. Customer understands importance and key principles of GDPR. Customer understands penalties and risk of non-compliance. Customer understands the Business benefits of GDPR. Customer understands what are the PII data in PeopleSoft. Demo on PUM 27,26 Features supporting GDPR and explanation on existing features. Speaker(s) : Keerthi Chaithanya, Technical Consultant, Kovaion. 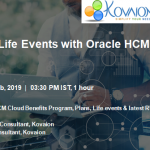 For queries or more details, email us on events@kovaion.com mentioning your full name, designation, company name, address, and contact numbers.